Mounts easily on outside of Aquarium glass. As such, we have a huge wealth of experience in online trading. At present we list nearly 5,000 specialist aquarium & pet products suitable for Aquatic, Reptile, Cat and Dog enthusiasts. Digital display for your choice. 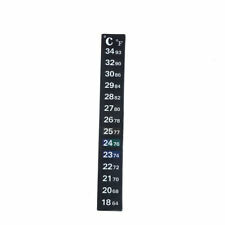 High quality waterproof probe with the wire length of 1.5m, suitable for many places. 3 digits digital display, easy to read. - Mini size, easy to use. Sincerely hope that you can understand! Attaches to inside of aquarium glass. As such, we have a huge wealth of experience in online trading. At present we list nearly 5,000 specialist aquarium & pet products suitable for Aquatic, Reptile, Cat and Dog enthusiasts. Celcius / Farenheit. Mounts easily on outside of Aquarium glass. As such, we have a huge wealth of experience in online trading. At present we list nearly 5,000 specialist aquarium & pet products suitable for Aquatic, Reptile, Cat and Dog enthusiasts. BUY WITH CONFIDENCE! WE HAVE SOLD OVER 1750!!!! If the surrounding temperature is 27°C, then the background of scale mark 27°C will turn colorful and other scale marks remain black. Stick on the outer surface of fish tank. Simple to use and convenient to read. Green Bar Indicates Aquarium Tempreature. Suitable For Any Tank. Temperature range is from 0 C to 50 C. Temperature shown in centigrade. Temperature shown centigrade. Easy view scale in Centigrade. For use with all types of aquarium. With easy to see acceptable temperature range. The green band marks between 23-29 degrees. Retro analogue display. Accurate temperature reading. Readings in degrees celcius and farenheit. It has a safety zone indicator for most tropical fish. Use suction cup (included) to stick to inside of aquarium. If you feel the item listed is not as described don’t leave low DSRs. Give us the chance to correct it! Depending on the origin of the fish varies the temperature at which they feel comfortable. Suction cup. The vital functions of poikilothermic animals sink with falling temperatures. Good quality! Excellent Service! Due to the lighting effects, monitor settings, etc. Fits: Aquarium, other water activities. Oval shape, beautiful design. 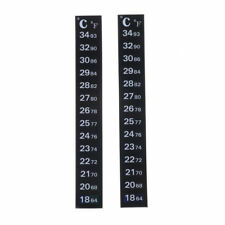 range from -20 °C to 50 °C (-4 °F to 122 °F) easy to mount with sticker on the back . Ideal for nano cube. Marke Dennerle. 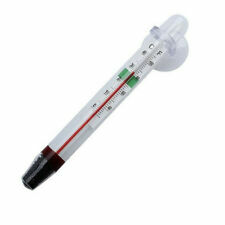 Suitable for cold water and tropical aquarium. Accuracy: ±1℃ (precise). Orders are processed and dispatched within 24 hours. We want to make sure you can get your goods in any best way for you.